Suburbs near big cities are booming, too. Of the top 15 fastest growing cities in the country, six are in Texas. The U.S. Census is out with new numbers on which cities grew the most and which cities grew the fastest last year. Texas leads the pack in both categories. “What you’re seeing is just phenomenal growth,” says Steve Murdock, former head of the Census Bureau and current director of the Hobby Center for the Study of Texas at Rice University. Of the top 15 fastest growing cities in the country, six are in Texas. Read the list and you’ll probably see a trend. They’re all suburban or satellite communities. “Most of that growth is from in-migration, meaning people moving mostly from other places in the United States and Texas into those cities,” says Lloyd Potter, state demographer of Texas. Those suburban communities grew fastest because they started off smaller. But if you take a look at the 10 U.S. cities that had the biggest raw increase in population, Texas leads again. San Antonio, Dallas, Fort Worth, Houston and Austin are all in the top 10. Potter says a lot of newcomers from out of state are coming from California, Illinois and Florida. “We also see [new arrivals from] New York and then our surrounding states,” he says. Why? No surprise, Potter says – cheap land, a strong economy and a central location all make Texas an appealing destination. What are the downsides? The fact that the state is importing a lot of its skilled workforce suggests it is not doing enough to educate its own people for jobs here. 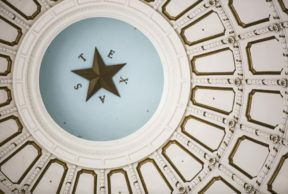 “I would argue that the biggest challenge is still to ensure that all Texans have the skills and education they need to be competitive,” Murdock says. He says transportation and cost-of-living woes are also side effects of growth familiar to most people living in Texas cities.